There are a lot of new things about the new year – new clothes, new perspectives, new resolutions and apparently also a new engagement of two people most of us love! It’s official. Rory McIlroy and Caroline Wozniacki are engaged. On Wednesday morning in Australia, the golf and tennis stars announced their engagement to the world via Twitter. 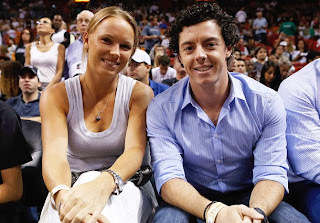 Apparently, McIlroy proposed to Wozniacki while she was in Sydney, preparing for the Australian Open. McIlroy’s tweet goes: “Happy New Year everyone! I have a feeling it's going to be a great year!! My first victory of 2014 #shesaidyes! !” Attached on the same tweet is a photo of him and Wozniacki, fireworks over the harbor to probably epitomize the celebration the amazing news deserves, and a picture of the ring he’s given her. Wozniacki announced the engagement to her fans through a tweet, as well: “Happy New Year everyone! Rory and I started 2014 with a bang! ... I said YES!!! !” The same collage is attached to the tweet. This just proves that the rumors of them splitting up spreading all over Ireland are indeed just rumors. The reports have been going around since August, and some people have been trying to insist they’re true although the couple has been seen together many times, including for dinner before the U.S. Open. The two started dating just a few weeks after McIlroy set a record in Summer 2011. It took a few months before they told the world about it, but what’s special about this couple was that they always seemed pretty open to the world. Some say it’s comical and pretty cute how McIroy changed his Twitter display photo to a photo of Wozniacki being number 1 and McIlroy, second. Within half a year, however, McIlroy became the first in the world. Currently, Wozniacki is tenth in WTA, while McIlroy is still number six in the official world ranking. It cannot be denied that McIlroy has been having a pretty tough season. Expectations of him are, to a certain extent, not met. He left his management company, changed equipment and haven’t at all won a tournament before the Australian Open last December. McIlroy, however, personally said that he doesn’t care about people criticizing his golf, as long as they don’t start to dig into his personal life – Caroline, his management and some other things they use to justify how he’s been playing. Even though the season’s been tough for him, it’s nice to see how this engagement has been his heartwarming plot twist. Albeit McIlroy admits he and Caroline have been on and off this year, we are all pleased to see that they’re on now, and it looks like this one is for good.